Totally portable, this desk is similar to a Field Commander’s Desk with the top Detachable for easy moving. 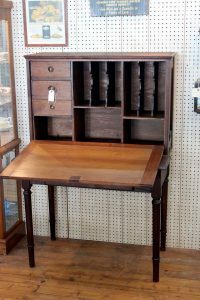 This is Oak, American, Drop-Front Secretary. Offered here by Emerald City Antiques and Collectibles, located Inside The Antique Gallery of Lewisville, Dealer #0033. This desk measures 36.5″ Wide, by 24″ Tall by 11″ in Depth. It sits on a custom notched table 30″ High by 22″ in Depth, by 38″ Wide. Circa “Civil War Era” up to late 1800’s. Stop in and Check out this unique piece today!